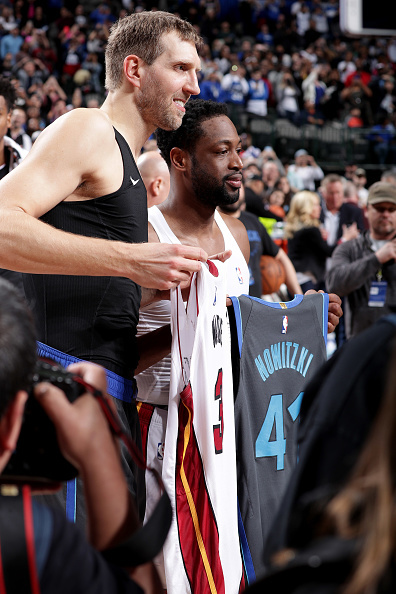 Dwyane Wade will make his 13th and final All Star Game appearance this Sunday, as he and Dirk Nowitzki have been selected "special team roster additions" by NBA commissioner Adam Silver. Wade was also honored by Magic Johnson, who reflected upon Wade's epic performance in the 2006 NBA Finals which propelled the Heat to win the NBA championship after falling behind 0-2. "Your hero was Michael Jordan. Well, you were Michael Jordan in that Dallas series." Wade was selected by fellow Banana Boat Crew member LeBron James in the third round of the All-Star Draft, just as everyone expected. The 2019 All Star Game, taking place at Spectrum Center in Charlotte, will air on TNT on Sunday, February 16 at 8pm ET.